Aerial lift workers are relied on for a near-endless array of job tasks. From heavy machinery maintenance to large-scale construction work, one thing’s for sure: without aerial lift operators and other aerial work platform (AWP) employees, many crucial jobs would never get completed! Painting is another common task that can require an aerial lift. Painting and contracting firms use aerial lifts for both indoor and outdoor projects. Some of the most skilled aerial lift operators around are mainly painters by trade! The ability to maneuver in tight spaces, avoid overhead hazards, and still provide 100% paint coverage is no easy job. Aerial lift painters must deal with unique safety hazards while still getting their jobs done on time. Painting at heights on an aerial lift certainly has some safety risks. Tip-overs are a common cause of injuries and fatalities, as this incident in the state of Washington shows. ALC helps any aerial lift or scissor lift painter prepare for on-the-job hazards. Our affordable training courses are ideal for both beginner and advanced aerial lift operators. It doesn’t matter how experienced you are – what matters is whether or not you’re OSHA certified. Painters, just like every other type of aerial lift operator, need to stay aware of job hazards, while also balancing their unique workplace requirements. Let’s paint the perfect picture of safety atop an aerial lift. Organize your tools. Multiple trips up and down on an aerial lift aren’t ideal for painters, especially in outdoor conditions. Make sure you have everything you need before starting. This includes drop cloths, paint, brushes, and protective equipment. Pay attention to the weather. For outdoor aerial lift painters, this is extremely important. Sudden shifts in the weather can make any job dangerous. Keep an eye on the weather forecast. Mind your max load capacity. Every aerial lift operator needs to know their lift’s maximum load capacity. 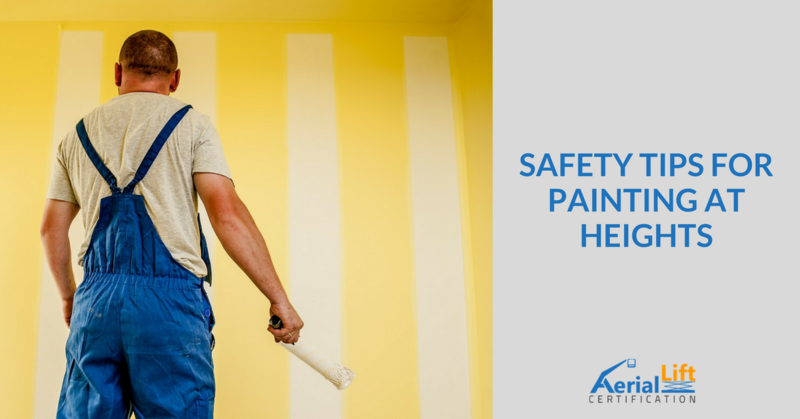 If you put too many painting materials on the lift, your safety could be at risk! Ensure ground stability. While aerial lift painters are focused on their job up in the air, don’t forget about ground conditions. Wet, slippery, or uneven terrain can derail any painting project. Always make sure the ground is stable and secure enough for safe aerial lift use! Watch out for overhead hazards. Be mindful of ceiling heights indoors and other height dangers like power lines and overpasses outdoors. Sign up with AerialLiftCertification.com Today! A painter is just one type of aerial lift worker that requires OSHA aerial lift certification. With ALC, we’ll help you achieve compliance – faster and more affordably than you think. We have guided, self-paced or group training for all of our training courses. Our training content is developed to meet and exceed OSHA regulations 29 CFR 1910, the National Fire Institute, and the American National Standards Institute. For any questions about our aerial lift and scissor lift OSHA training, give us a call today at (888) 278 – 8896. Thanks for considering ALC for your aerial lift training needs!